Adam Tabeling is a 4th-year graduate student in the Department of Classics, whose research focuses on Greek and Roman iconography, Roman relief sculpture, and politics and propaganda in Roman art. He is currently writing his dissertation on imperial images of Virtus, the Roman goddess of manliness, courage and martial valor, and her militaristic relationship with the Roman emperor. 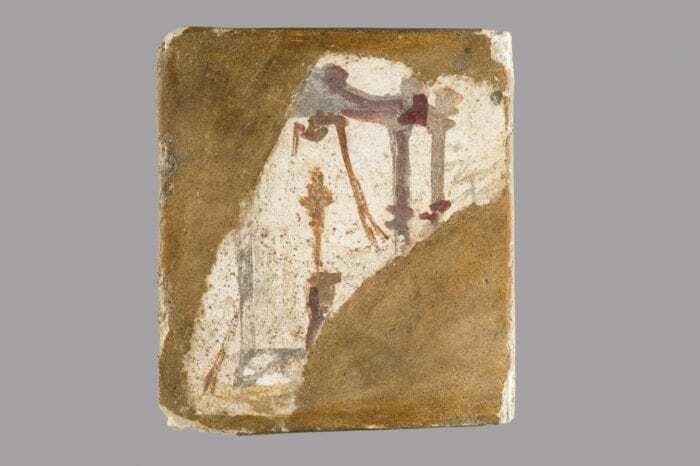 Images of Roman cult and religion often appeared on the painted walls of domestic spaces, and this fresco fragment is a testament of the popularity of such religious motifs. Here, a small shrine – with ornamented columns and a golden garland hanging from its pediment – houses a golden cult statue of a god or goddess, which stands on a tall base. Notice the two torches that lean on the left side of the shrine. Torches were common offerings in sacral-religious landscapes and, here, they may suggest that torchlight was used to illuminate the cult statue.